Now deep into my second week of being alone, I haven't gotten over how normal everything has been. The silence, of course, continues on and on, but I've come to inhabit it. I spent Sunday cleaning and staying indoors, trying to take a day off after so many days — too many to count — of working. When no one is waiting at the iron gate of our terrace house, I feel more at home in my office on campus. There's no pressure to get anything done when the day and night stretch out uninterrupted before you. Another day and another and another. I dreamt that my family died in a car accident and then feared saying it outloud. Silly fears, of course: the girls appear on the other end of a Skype call. Everything is fine, only glass separating us, like visiting your father in prison. What's the metaphor there: ʟᴏɴᴇʟɪɴᴇss ɪs ᴄᴏɴғɪɴᴇᴍᴇɴᴛ, sᴏʟɪᴛᴜᴅᴇ ɪs ᴄᴏɴғɪɴᴇᴍᴇɴᴛ? The neighbours brought me chicken curry, handing it over the fence. I wrote in the last blog of the moment as a node, connecting the experiences of the past with the future. I'm not sure if this is the best image. The moment is a photograph; the past, a sketch on tracing paper laid on the photograph. The doorway to the house, if I look long enough can be inhabited with memories of the girls coming in and out. You can see it if you want to. Or I can see the future: me coming home in two years, to this same house, becoming a home. What pasts with inhabit this place in the future. So I sleep, I wake up to the call to prayer; I open the doors again to let a grey morning light in. Every day is one day closer to everyone being back together: how many hours will it be before I take my children and wife for granted again? Somewhere over the rainbow, way up high. Somewhere lost in a lullaby. In Kuala Lumpur, there is also good jazz, sung by an Indian man with a closely cropped white beard and backed by an incredible drummer. When he asked for requests near closing time last night, I shouted out 'over the rainbow' before anyone else. A perfect song that he played perfectly, reminding me of my place in history: a moment as a node linking a vast history to a vast future. The night Yoko and I married in Niigata City, another jazz pianist played the same song. How I got from that moment to this one is too long a story to tell. I suspect normal people in the real world have discussions that don't always involve fundamental questions about human experience and social contexts. People, I imagine, talk about sports and television; I don't ever find myself in conversations about sports or television. Instead, all my conversations leave the residual thoughts of talking about a new set of questions and challenges: class and gender and race. How any of us manages to navigate the world is a mystery to me. As a part-time social theorist, I love talking about other people, pulling apart piece by piece everything they say and critically analysing their take on gender and class. A hypocrite though: I'm less comfortable talking about my own problems. It's so unfair. The problem is, the truth is, that everything we believe and do and think is a complex interaction betweeng any number of components, only some of which we are aware of, a recurring theme in this blog. The work of the academic, the analyst, is deconstruction, but once you learn this tool to do your research, suddenly you use it all the time. There is so much explanatory power, provided you are willing to be explained and to explain. So why does any one of us do the things we do, make the choices we make. Do we even make choices. I walked endlessly in the heat all day: from Bangsar to Pasar Seni, and home from the station in Kajang, talking in my head with everyone I know. Like this: the scene in Lost in Translation where after going to karaoke, Bill Murray's character is in a cab with Scarlet Johannson's character and there is just the residual sound of this My Bloody Valentine song playing, like they had left the night, gone home, but the night was still sticking to them. I can only manage obtuse, opaque writing about the last week. The odd sensation that everyone is watching. This blog is the perfect alibi: hide in plain sight. I'm embarrassingly in search of a theory of everything -- the search, a kind of vestigial organ of my Evangelical faith. I want truth: I want to know the one cause, but if I've learned anything, it's this: there is never, not ever, never one cause. Instead, there are causes, an endless list of causes and when you think you have identified them all, you have only identified the identifiable ones. How many unknown unknowns lurk just beyond your perception. Many more than you think, I'm sure. Maybe this truth, embodied in the entropy of our terrace house: left alone, everything gathers dust. All the objects, some material, some immaterial, remind me of being alone. The house, the emptiness, is hot when I come home late from working later than I would have otherwise, but there are no sticky hands to grab onto me when I open the door so I put it off as long as I can. I left the fan on yesterday: I had spent the night in the city again, in a guest room in KL, but I fell asleep alone. Another empty cavernous house, with heavy wood chairs. I woke suddenly, reaching across the bed for my wife's absent body. A truth: you can never sleep in the middle of a bed. You always favour one side, subconsciously leaving space for another. Or this: you will always talk about what matters to you most, despite where you are and who you're with. Empirical evidence: a view of the city from a condo in Bangsar, all these people I don't deserve to be sitting with. Suddenly, I catch myself talking about my children. If I had pictures in my wallet, I would make everyone look at them. In my theory of everything, I think there are no exceptions to this rule: never say no to sitting with people who know more than you. Or this truth: life with others is always better than life alone. Not always. Most of the time. A majority of the time. Another day passes: Yoko will not be home again. Yoko, the woman I love: of course distance reminds you what you know, what your body already knows. I love you, stay with me, I wrote once in a poem voicing Bahktin's longing for his own wife. I am so sick with love. Love might be a theory of everything: I warn myself again and again, Never tell the truth; serve the narrative. The narrative will eventually become the truth. When I woke up on Saturday, again, silence. I slept through the azan and when the alarm went off, the house was empty and cavernous. I went to work, paid road tax, shopped, came home, took a nap, and left for the city, talking to no one on the way. I picked up the house, cleaned the floors and put up the toys thinking, This will not come off the shelf for a month. I had envisioned this time away from the family to be different — more depressive or more liberating or something — than it has been. I sleep well in the house alone: I had worried I would have trouble sleeping. I've been cooking simply, vegetables and meat: the sorts of things I want to eat. I wash my things and put them away. Turn lights on and off. Sleep and wake up. 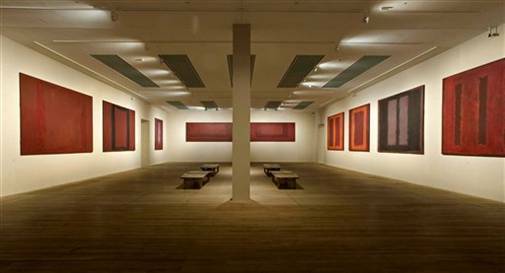 An empty Rothko room — colours on colours, a frame. Naomi, you are six today. Six. You are so big now: I remember that day you were born so well. You changed my life, like your mother had the year before. Your face, the first time I saw it, was a revelation. This morning too, as you stood in your room looking up at me, waking up to your birthday: a revelation. Naomi, I loved you when you were born and I love you now and every day with you has been better than every day without you. Mei, you are four today. Four. You had such a hard year: you were sick for so long. I remember this about your last year: Mummy washing you in the shower as you screamed and screamed. Mummy kept saying, shouting over your screams, 'We will not lose to this illness!' She used that word in Japanese 負けない. You did not lose — you fought through it and now you are stronger, more confident than ever. I love you, Mei: you are your own particular person, with all your own particular peculiarities. I hope this year is better than the last. Malaysia, this 'one Malaysia' that we are all promised, has deep schisms and histories. The Chinese contingent in Taman Sri Minang warned us to stay indoors the night of the election and I wondered what it would look like if the country exploded with race riots. The next morning, the election stolen, I woke and went to get water at the strip mall. There was a holiday in the state of Selangor and everything was moving as it normally would — the Indonesian cafe full of people leisurely eating nasi lemak with their hands. I filled the water bottles and went home, wondering what change would really look like here. But Malaysia in my narrow view of it just serves as the backdrop to my own narrative, tending towards the stagnancy of waiting for my monthly salary. Democracy? Race riots? Fine, but will I get paid on time? Yoko and the girls will go home to Japan on 17 May and I am watching Yoko prepare, packing the bags and buying souvenirs, wishing I could go too. Of course, this is the wrong thing to say — how fundamentally selfish. I kiss the girls at night and wonder what I will do without them for 28 days. What they will do without me. Again, what to say: I am stuck in this cultural no man's land: do I act like I am American or like I think a Japanese husband would. Understanding nothing but understanding everything: can you even put it into words. So I am making plans to bury myself in my work for the next four weeks. Escape the weekends when I can with more work. Travel with colleagues to a conference in Johor Bahru. Save money. Avoid being alone. Work. And work some more.